Finalists from the 2017 Men’s Open Singles Final: Keegan Oh-Chee and Mick Connell. Photo: Tennis ACT website. It’s the start of the school holidays this weekend and there is plenty to keep the kids entertained. The Canberra Wheelchair Open is on at the Canberra Tennis Centre, the Brickman Experience—a massive exhibition of Lego models—is on at Exhibition Park, and the ACT Government has set up a pop-up play space in Civic Square for the entirety of the school holidays. For something more cultured, the Canberra Youth Orchestra is collaborating with young local singer-songwriter Lucy Sugerman to perform her songs on Saturday night at Llewellyn Hall, Josephine Wants to Dance is on at the Canberra Theatre this Saturday and don’t forget the huge exhibition—Rome: City and Empire—that has just opened at the National Museum. If a relaxed long weekend is what you are after, Floriade NightFest is on with a huge line-up of musicians and comedians to keep you entertained, or head out of town to the Murrumbateman Moving Fest and indulge in a lazy afternoon of fine food and wine. Floriade’s NightFest started this Wednesday and will run until Sunday night illuminating the flower festival with food, music, entertainment, and lights. Grab dinner, enjoy the flower beds lit up at night, and settle in for a great line-up of entertainment. On Friday night Caiti Baker, Jeff Duff, Bowie Unzipped and Kate Miller-Heidke are performing. On Saturday night one-man bad extraordinaire Juzzie Smith, party band Big Boss Grove, and 80s synthpop masters Cell Block 69 are performing; and Sunday night is comedy night with The Stevenson Experience, Christine Ryan, Akmal Saleh, Matt Okine, Melanie Bracewell, Andy Saunders, Nikki Britton, and Arj Barker performing. Tickets for a single night are $31.70 for adults, $16.40 for concession and $16.40 for kids, book here. The Canberra Wheelchair Tennis Open is on at the Canberra Tennis Centre this weekend. 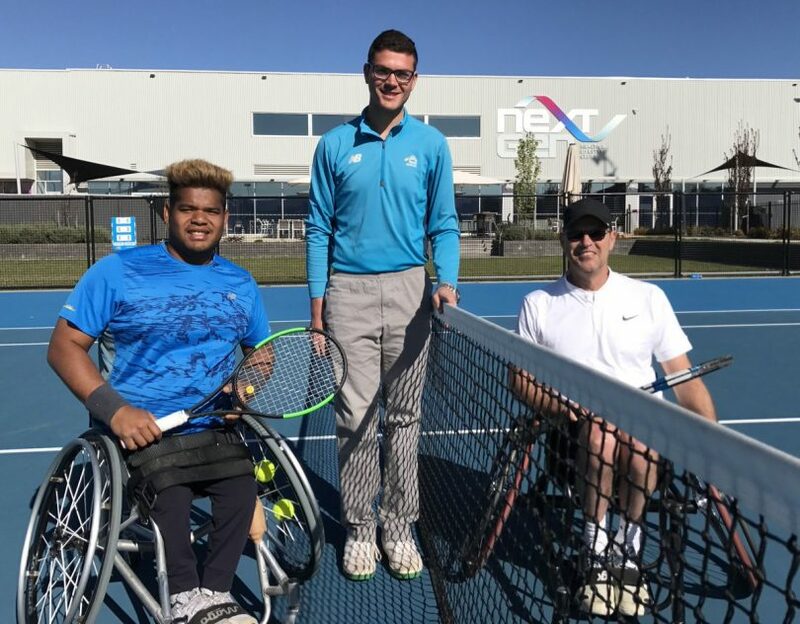 This event is part of the International Tennis Federation Futures Series and will feature some of Australia’s best wheelchair athletes. Head down this Sunday between 10 am–12 pm and try wheelchair tennis for yourself! Then hang around and watch the tournament’s finals. The Murrumbateman Moving Feast is on this Saturday and Sunday. Roam from winery to winery enjoying fine food matched with fine local wine. Nineteen participating wineries are serving a savoury dish for $25 and a dessert for $20. The cost includes a matched glass of wine. Check out the list of participating wineries and their menus here. Then on Monday, wind down at Music Monday with six wineries cranking up the music. Check out the list of participating wines here. The National Film and Sound Archive is screening a free program of classic Japanese films this weekend. The program includes the films Kagero-za, a 1981 adaptation of Kyoka Izumi’s story of a playwright who meets a beautiful woman he suspects is the ghost of his patron’s deceased wife; A Geisha, a 1953 film about an aspiring geisha and her mentor; feminist New Wave 1957 film The Affair; and the intriguing queer melodrama from 1964, Manji: The Goddess of Mercy. The Brickman Experience is an exhibition of 60 Lego models built by a team of Lego builders headed up by Certified Lego Professional Ryan McNaught and it is coming to Canberra these school holidays. The models in the exhibition are made from over 5 million Lego bricks and include Ryan’s biggest ever Star Wars Lego model, a quarter scale Lego Ferrari, and the world’s largest Lego flower. Tickets are $25.50 for adults, $19.90 for concession and kids under 4 are free, book here. The exhibition will be in town until 14 October. The City Renewal Authority is setting up a pop-up play space in the city these school holidays. Until 14 October there will be a play space in Civic Squire with hoops, poles, crates, ropes, sheets, and tyres. And while you’re there, drop into the Canberra Museum and Gallery and check out Spring it on at CMAG, a range of self-directed creative activities for kids inspired by works of art on display in the Gallery. Welsh singer Aled Jones, who came to fame in the 80s as a boy soprano, will be performing an intimate concert at St Christopher’s Cathedral in Manuka this Friday evening. Aled has just released a new album—Believe. Tickets are $65 + bf for adults and $60 + bf for concession, book here. The Canberra Fashion Market is on at Exhibition Park this weekend. Find new and vintage clothing, accessories, books and treasures as well as food and coffee. The Canberra Youth Orchestra is joining forces with local singer-songwriter Lucy Sugerman this Saturday to perform Lucy’s own songs arranged especially for the CYO and David Bowie’s Space Oddity which catapulted Lucy to fame on The Voice. The orchestra will also perform classic John Williams film scores. Tickets are $30 for adults and $20 for concession, book here.